The protagonist in the 1999 fantasy film Being John Malkovich is Craig Schwartz, an out-of-work puppeteer. One day Craig discovers a hidden doorway behind some cabinets in an office building where he has landed a temporary job as a filing clerk. Intrigued, he crawls into what seems to be a damp tunnel. Suddenly the entry door slams shut behind him and Craig is hurtled through a space-time vortex that thrusts him into the mind of the film’s namesake, actor John Malkovich. Later, back in the office, Craig tells the story of his amazing experience to his coworker, the opportunistic Maxine. She speculates that other people might be willing to pony up for a brief sojourn in a famous person’s head. They place a newspaper ad and soon people are lining up at the portal after work hours with cash in hand. Delivered through the tunnel, the mind travelers delight in experiencing the world through the eyes of a celebrity, even if he is engaged in such mundane activities as ordering towels over the phone, rehearsing lines for a play or flagging down a taxi. These mind trips are short-lived. The eavesdroppers are again sent flying through the vortex only to come tumbling down into a ditch beside the New Jersey turnpike just outside the Holland Tunnel. Craig retrieves the dazed travelers and guides them back home. These mind ventures seem to have an effect like travel to a foreign country. The sojourners not only have a vicarious experience of another person’s life, they also gain new insights into the existence from which they were temporarily extracted. What we might call the Malkovichian transformation is an exaggeration, or perhaps even a parody, of what can occur when we read a work of fiction, watch a play, study a painted or photographed portrait, or participate in other acts of the imagination. We are released from our current preoccupations and drawn into the life and times of other human beings. We may feel the guilt of Dostoevsky’s Raskolnikov, the sorrow of Shakespeare’s Ophelia, the joy of the figures in Matisse’s painting, The Dance. Characters and scenes stay with us as if etched in memory and come back to us, unexpectedly, in times of struggle or triumph or boredom. How does an expert in ‘creative retirement’… retire? When Jorvik Press author Ron Manheimer retired in 2009 as founding director of the North Carolina Center for Creative Retirement, he thought he knew how to leap into the next chapter of life. Heading up this lifelong learning, leadership and community service program at the University of North Carolina, Asheville, he had led countless weekend workshops for hundreds of people considering their next chapters. He formulated his approach as Ten Keys to a Creative Retirement. One of the keys, “adaptive reuse,” advised pre-retirees to reflect on how they might extend their accumulated talents, knowledge and interests, and project them into new yet related activities. Ron borrows the term from the field of architecture where it refers to restoring an old building to house new functions, like turning an empty warehouse into an art museum or an outdated fire station into a restaurant. As an example, Ron points to a former banker with a love of classical music who became the treasurer of the non-profit board of a civic orchestra. But instead of following his own best repurposing advice, Ron headed elsewhere. “For a truly creative retirement, I decided I should try to come up with activities that would be unprecedented for me,” he says. Not much of a gym guy, he found a personal trainer, developed an exercise program, lost 25 pounds and took up hiking. Apprehensive about death, he became a hospice home visitor. A longtime grant seeker, he joined the board of a foundation that funds other people’s projects. An author of several books and a raft of scholarly and popular articles, he came across a deferred book project. “Clearing out some old computer files, I discovered the chapters I had put aside. Work and family demands had halted any progress on the book several years earlier. “But I felt the spark of intellectual excitement still alive in those pages. It was about how philosophers portray their own life experiences and realize their most noteworthy ideas. Find out for yourself how the project turned out. Buy Mirrors of the Mind here, or order it from your favorite bookstore. Ron Manheimer lives in Asheville, NC and is available to talk about his new book and the creative retirement process that led him to write it. The field of philosophy is a formidable one, even for the well-educated. Its self-referential technical vocabulary and abstract discussions may seem remote from the issues and experiences of everyday life. Yet, in our own ways, each of us is a seeker of wisdom. We may wonder how our life experiences influence our ideas and values, and vice-versa. Can we find our place among the seminal figures of the great philosophical traditions, both east and west? Mirrors of the Mind aims to help bridge this gap. Readers drawn to philosophy often find the standard histories and introductions distant from their personal lives. Many are more curious about how historically influential thinkers actually lived. Could there be a connection between the general truths that a school of philosophy asserts about the universally human and the particular flesh-and-blood truths of the philosopher’s life? 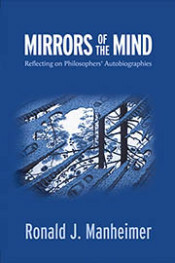 Delving into the newly identified genre of the philosophical autobiography, Dr. Ronald Manheimer’s Mirrors of the Mind takes both the neophyte and the initiated on a unique literary and philosophical journey through the works of important thinkers. This guided tour of the life of the mind covers self-reflective narratives ranging from fourth century Augustine’s Confessions to 20th century Simone de Beauvoir’s The Prime of Life. Mirrors of the Mind looks into the private lives, made public in narratives by important thinkers who have changed the world or, at least, how we perceive it. The focus is not highbrow gossip or sordid revelations about a philosopher’s life, but rather a search for the creative embodiment of thinking and being – the architecture of the soul. These first-person narratives serve as the loci in which philosophers’ lives and the ideas that have animated them are joined or paralleled. The philosophical autobiography is a literary space in which the thinker turns his or her analytical mind and the tools of the trade on his or her remembered past. At its best, the philosophical autobiography helps us to see great minds as real people who wonder and suffer, analyze and romanticize, communicate both bliss and darkest despair. The accounts they give of their lives show that many of their most famous ideas occurred in moments of sudden illumination that would take them a lifetime to explicate. These works demonstrate that analytical judgment may go hand in hand with acts of imagination; that calm, cool, reason may intersect with an impulsive leap of faith. 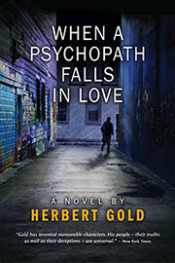 Through such authors, the reader shares exemplary instances of a thinker’s emerging sense of purpose, engagement with the critical issues of his or her time, perceived threads of continuity through a life of change, and the search for integration of ideas and experiences. Getting to know philosophers through their life stories helps to dispel the impression that great thinkers lived only in their heads. For readers who wish to explore the subject further, each chapter ends with suggested reflexive writing exercises and philosophical fieldwork. An unintended event. This was the bland phrase used to describe Luise’s sudden death in the psychiatric ward at Amager Hospital in Copenhagen, Denmark. She was 32. 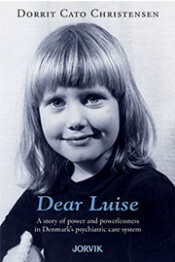 Dear Luise is a mother’s deeply personal account of her struggle to ensure her daughter’s survival through 20 years of treatment in the Danish mental health system. It is an alarming – and thoroughly documented – exposé of the abject failure of the medication-based treatment regimen routinely imposed on vulnerable psychiatric patients. This book is also a poignant tale of love and hope, brimming with tender memories of the creativity, originality and wry humor of a very capable, intelligent young woman. Behind Luise’s ultimate fate we see the smug certainty of mental health professionals, both doctors and caregivers, and the concomitant dehumanization of their patients through indifference, harassment, coercion and the use of force. In this tragic case, the mother’s investigation also reveals a shocking trail of incompetence and dishonesty – repeated misdiagnosis, professional collusion, “missing” official records, falsified hospital charts, victim-blaming, and a complete lack of accountability. Her mother’s ill-fated trust in Denmark’s healthcare system led an 11-year-old girl with misunderstood adjustment problems into a doctor-mandated drug hell. First she was wrongly diagnosed and dosed with powerful anti-epilepsy medicine. Then the severe side-effects were treated with antipsychotics that caused even more serious adverse reactions, both mental and physical. Complaints from mother and daughter ran into a stone wall, and all meaningful dialogue was cut short. The system had only one response – increase the medication. Luise’s tragedy is far from unique in Denmark – or indeed any other “advanced” industrialized country. Towards the end of her life she knew what was happening to her. Luise told her mother: On my gravestone I want it to say that it was the medicine that killed me. Black Crusader is the story of how a young man from a small North Carolina town who dreamed of becoming a poet was transformed into an archenemy of the US power structure. At school and in college, in the US Army and Marines and in his home town in the 1950s, Robert Franklin Williams witnessed the scourge of segregation, exploitation, beatings and even murder. He soon decided to apply his combat training, intelligence, organizational skills and fearlessness to take a stand against the race hatred he saw around him. 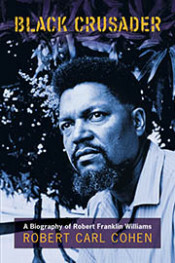 Williams became the first black liberation militant to advocate armed self-defense. But in 1961 an explosion of government-supported racist violence – and a trumped-up kidnapping charge – forced him to flee the country and seek refuge and support among America’s Cold War adversaries, in Cuba, the People’s Republic of China and finally in newly independent Tanzania. Included in these pages are historic events such as Williams’ talks with Fidel Castro and Mao Zedong, details of the infighting in the Cuban Communist Party, his meeting with Che Guevara, and his impressions of life in China during the first years of the Cultural Revolution. This biography is based on five weeks of interviews by filmmaker and author Robert Carl Cohen conducted in Dar-es-Salaam in the tumultuous summer of 1968. Detailing the first 44 years of Williams’ life, as told in his own words, it is the story of an enigmatic and charismatic natural-born leader who was pursued in vain for almost a decade by the FBI and CIA. Williams’ talent for leadership extended to book writing, newspaper editing and managing Radio Free Dixie from exile. Though his message was totally suppressed by the US mainstream media, he was a friend of revolutionary leaders, inspired a generation of civil rights activists in the US, and was admired by millions around the world. Black Crusader concludes with the bizarre circumstances of Williams’ return to the US in 1969, after which all state and federal charges against him were quietly dropped without explanation. This was followed by the mysterious suppression by mainstream publishers of the first two versions of this book, now republished in full in this new illustrated edition.